India is a country of very rich tradition and culture. Here, the traditional occasions are celebrated throughout the year. These traditional occasions are social as well as religious type. Sarees are the most preferred attire of women when it is the time to celebrate a traditional occasion. These days most of the fashionable ladies are going for a traditional look for which they prefer saree every time. In fact, every part of India has some unique collection of sarees which can be displayed with pride all along. This makes the experience of wearing saree a complete legacy to celebrate different traditional occasions. The banarasi silk sarees are all about richness and these sarees were mostly weaved with silver and gold threads in good old days. The artisans used to take more than one year of time to complete a saree. The textures, sheens and great colors of banarasi sarees have also made it a popular bridal wear in India. Crafted in Banaras, these silk sarees have heavy embroideries all over its body, borders and pallus. 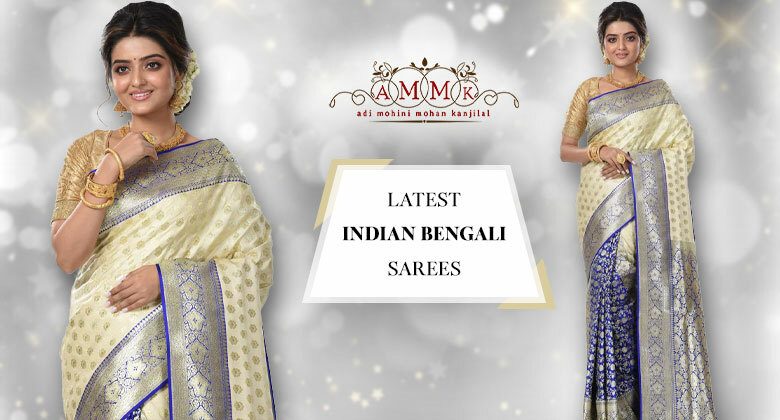 These sarees are the most chosen ones amongst women of India at the time of celebration of traditional occasions like Durga puja, Diwali, Ganesh chaturthi, Karwachout, wedding, different receptions etc. Traditionally designed and originated at Madhya Pradesh, the chanderi sarees are famous for its ethnic and sophisticated look when draped by the ladies to grace the traditional occasions and festivities. This saree is made with tissue silk having lovely translucent type of texture. This light weight saree is appreciated by ladies irrespective of age and for all types of traditional occasions. Chanderi sarees are of different designs like peacocks, traditional coins, geometric or floral arts etc. Ladies really look outstanding when they put on chanderi sarees in different occasions. Kanjivaram saree is again the most likable attire for bridal in India and the origin of this saree lies in the place named Kanchipuram which is in Tamil Nadu, a state of southern part of India. This saree is popular all over the country for different pujas, bridal receptions and other traditional ceremonies. It has earned a huge fame internationally for its features like rich texture, vibrant colors, refined quality, great elegance and graceful look. Another distinguishing feature of this saree is its beautiful borders with temple patterns. Ladies of all age would like to keep some kanjivaram sarees for wearing in traditional occasions. Dhakai jamdani is one of the hand woven sarees which are widely accepted by ladies for celebrating traditional occasions. For wedding and other social occasions and in various pujas also this saree is appreciated by everybody all over the country. Originated in Dhaka, this is now carried forward to West Bengal as well. These are feather light translucent sarees with fine motifs woven all over the body giving it a luxurious and grand finish. Unesco declared it as an “Intangible cultural Heritage of Humanity" which means to own a dhakai jamdani saree means having a piece of cultural heritage in the wardrobe. So, no wonder that it is so much of loved celebration attire for ladies to participate in traditional occasions. Now there are many other sarees like sambalpuri, bhagalpuri, muga silk, baluchari etc which are worn by ladies in traditional occasions. Unfortunately, there is not much of space to write about all of these sarees in this write up. All these sarees are there in prestigious showroom of Adi Mohini Mohan Kanjilal. To make a selection of sarees for the celebration of traditional occasions is not an easy job. But with the helpline available in Adi Mohini Mohan Kanjilal it can be done in an easier manner. So don’t delay much to indulge dilemma, collect your sarees from Adi Mohini Mohan Kanjilal showroom to celebrate the traditional occasions which are right ahead.